My 100th marathon since my diagnosis of myeloma in 2003. It's a major milestone. 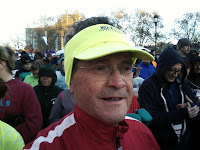 I finished in 6:47:17, fifth of six in my 75-79 age group. 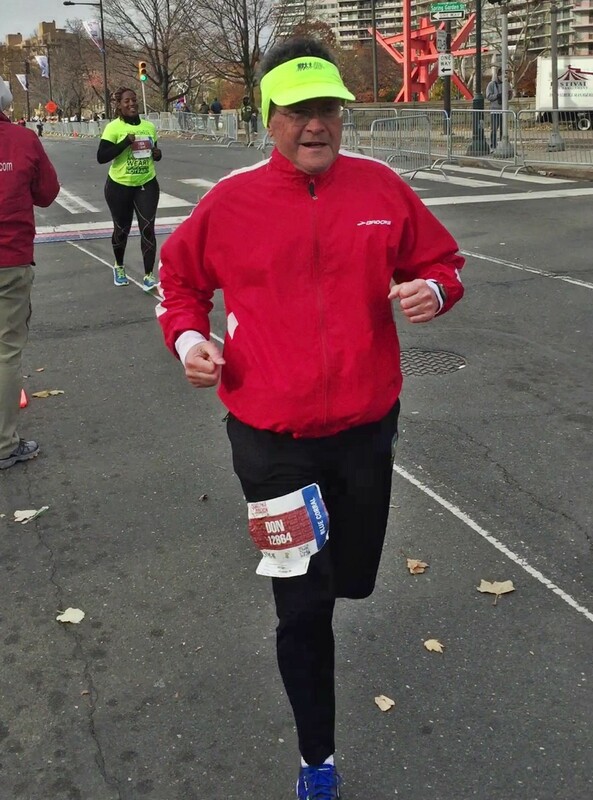 That finish was about 15 minutes behind my goal time, but if the Philly Marathon was the big story on Sunday, the weather was a close second. Temps in the 40's with winds of 20 to 30 mph, gusting to 50, made everyone's marathon take longer. The wind doesn't help a runner much when it's coming from behind, but it sure can make a flat road feel like a steep hill when running toward it. No fault of the race organizers, of course. In fact Saturday, the day before the race, would have been perfect for the marathon and was indeed perfect for the half marathon. 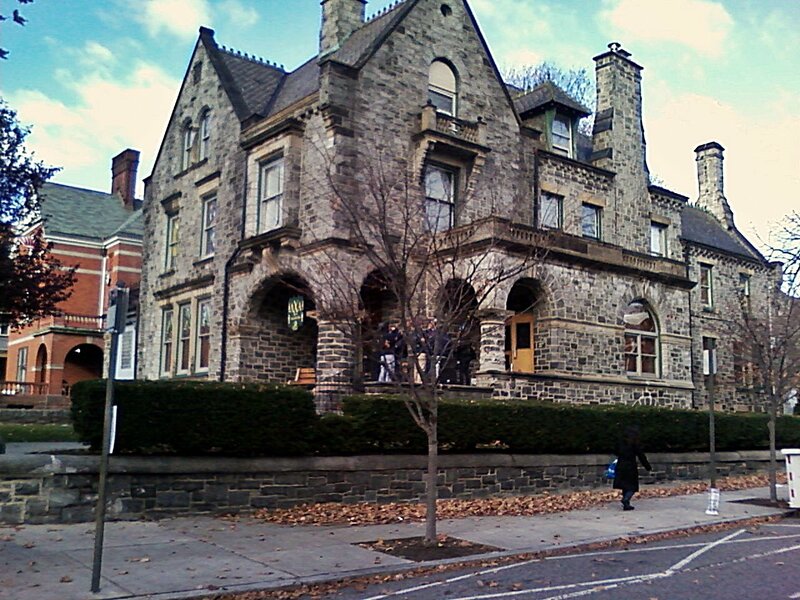 A Drexel Univ Frat House! Apart for some grumbling about the wind, I really had no problems. This time I didn't carry water, and there were plenty of aid stations. I took six Clif Shot gels with caffeine - those do give me a boost. I also took about as many salt tablets and one capsule of magnesium taurate to ward off cramps, which never appeared. I wore a visor and ear band up top, three technical (running) shirts and a wind jacket, good warm mitts, and both tights and pants below. I think the tights were overkill - I could have done with just the pants, but not sure, because my hips and thighs got a little cold anyway, and I think that reduces the efficiency of those muscles. Four layers above were plenty too - in the last six miles, going with the wind, I tossed one of the running shirts and was just fine. They don't get much better than this. All of the roads that we ran on were fully closed to vehicle traffic - the only thing we needed to worry about was being hit by a police vehicle, of which there were plenty and going plenty fast, I thought. Again, not something that's really in the control of the race committee, and who am I to question how the police do their job of keeping us safe? Organization was excellent, from the online registration process to the Expo (nice big one), and the race itself. Aid stations were winding down as I went by at my glacial pace, but there was always water and Gatorade to be had, with gels at two places, maybe more. Even in that cold, blustery weather, the volunteers were all smiles, and the police at the corners too. They like their marathon, and it shows. We passed lots of famous buildings and landmarks. One of my favorites was the children's "Please Touch Museum," housed in a National Historic Landmark built in 1876 for the Centennial Exhibition celebrating the country’s 100th birthday. 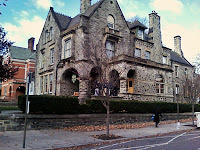 I passed this beautiful building on both sides. 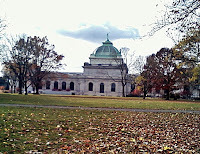 Philly is an historic city with a lot of character - I wish we'd had more time to explore. I would do this marathon again in a heartbeat, even with the same weather. I took a dozen photos along the way - that might account for part of the longer than expected finish time. 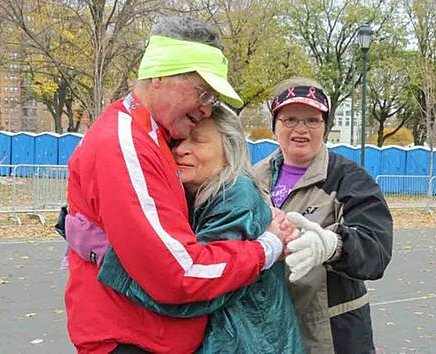 A nice 79-year-old guy from Canada was running his 227th marathon. He is originally from Manitoba, and says that he has run every single different Manitoba marathon, of which there are 28. BTW 28 is the same in English and Metric. A young woman sitting on her porch wearing a warm-looking Santa Claus costume was smiling and holding on tight to her cat. For a moment I wished I was doing something like that. For a while I kept up with a running juggler, because the wind was messing up his act. Don't know if he finished. At the finish a very smiley woman was one of the people hanging medals on the runners' necks. She said that she had read about me in the Philadelphia Inquirer and, seeing my medal, was disappointed not to be the one to present me with it. So I took it off and she put it on me again. We were both very pleased. Toward the end I passed a woman running with a mostly-full clear plastic pitcher. Big one. I asked if it was iced tea or beer. She sniffed it, and replied "beer." Apparently she had stopped where someone was handing out free beer, and they asked if she wanted a glass or a pitcher. So here she was, running down the road offering it to anyone with a need. I declined. Two friends, Roy and Jackie, met me before the race. Inspiring. Both are lots faster than me, so we didn't run together. Two other friends came to Philly too, but somehow we never connected. Big city, big race. 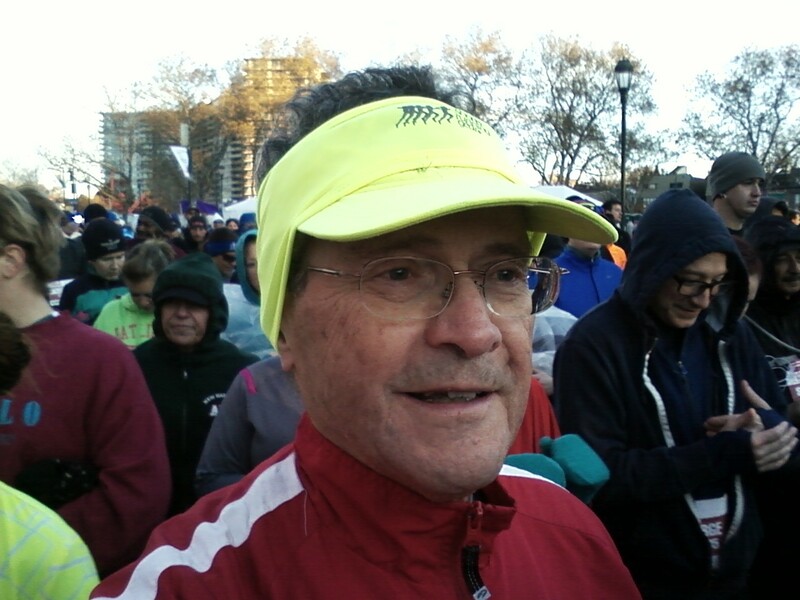 I run as part of a campaign called eRaceCancer, speaking out for: (1) Myeloma awareness; (2) More innovative, targeted medications for myeloma and other life-threatening diseases; and (3) Hope & inspiration for anyone needing either.. See HERE . 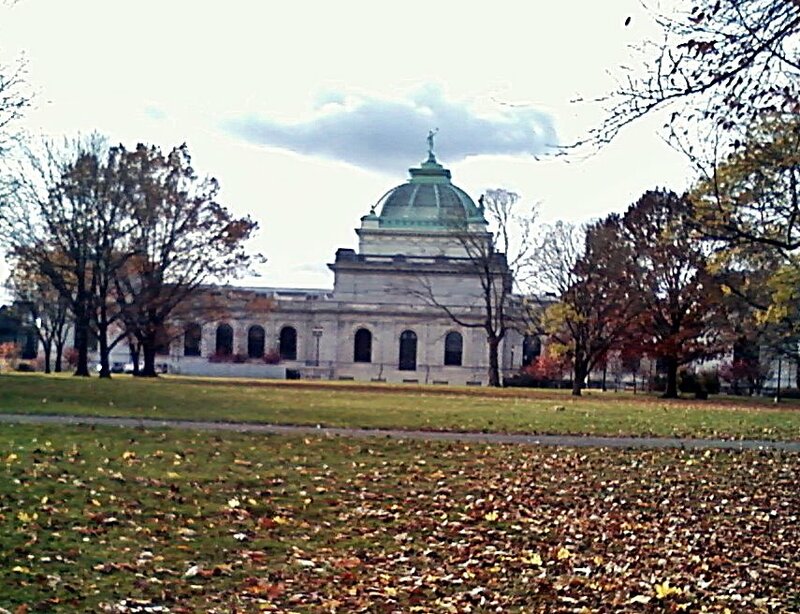 Splits: 41:46 (3 mi), 14:55, 13:51, 14:14, 14:43, 18:50 (major nature break), 14:38, 15:16, 14:45, 17:29 (nature break), 15:12, 14:48, 14:54, 15:53, 15:58, 32:45 (2 mi), 15:18, 16:39, 15:50, 15:28, 54:22 (3.2 mi), total 6:47:21. Website results showed 6:47:26 - What's 5 seconds among friends. Average pace 15:32. It was an honor to meet you, and a joy to run along with you for a bit, and Mr. 227, too. I'm glad you enjoyed running through our city, and yes, it's a wonderful place full of beautiful history, buildings and people to come back to visit. Thank you for the gentle write up for the race...it honestly had some issues... Philadelphians are not being nearly so kind as you. Keep running on - from your new mile 21 beer pitcher running friend! Well bless your heart. I did enjoy running with you for a bit. NOW I could use some of that beer! Hope you found a good place for it.